This article was originally created for, and published on www.gounesco.com, a UNESCO supported umbrella of initiatives that makes heritage fun, written by Arundhati Bhande. 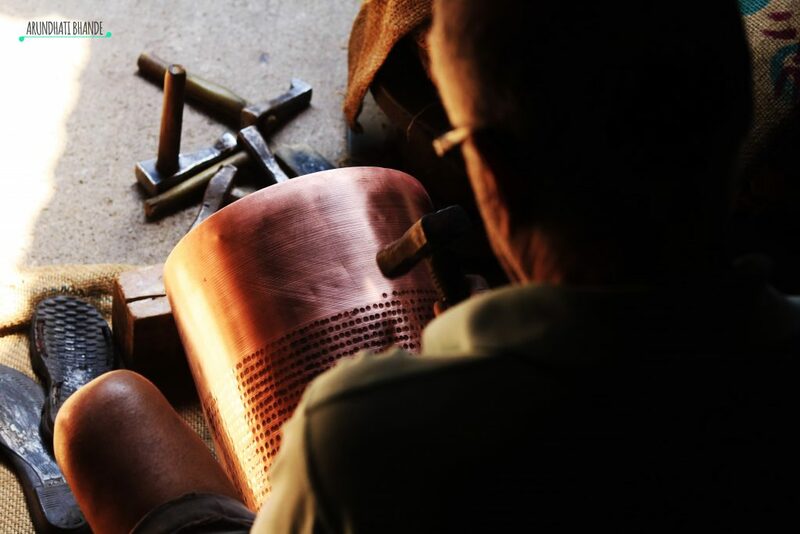 We belong to a society that is forgetting to appreciate the metal craft in Pune’s copper alley. Let us talk about the forgotten copper artisans of Pune, Tambit Ali workers. This Indian metal craft work has been passed down to us over generations. Moreover, we are forgetting to appreciate the artists who keep the fire burning. One such community of artists is the copper artisans from Pune, Maharashtra the Tambat Ali workers. This community settled in Pune around 400 years ago. The Peshwas were their first patrons. The community was once the talk of the town. 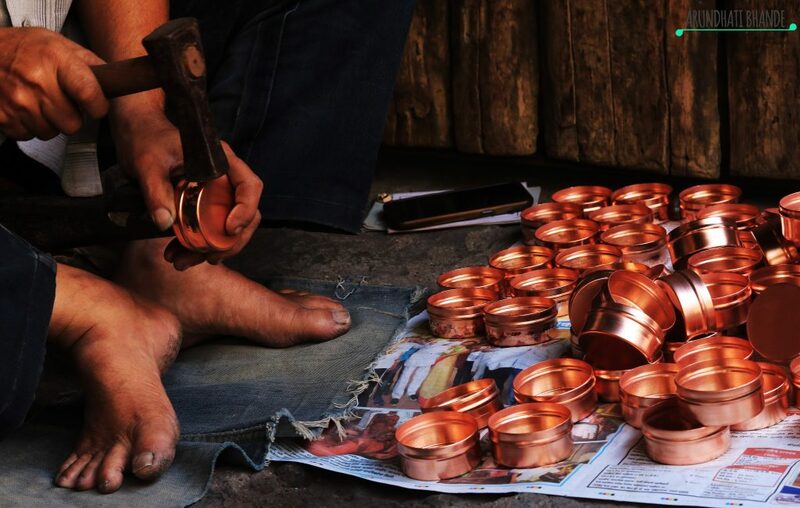 These copper artisans are sidelined with the advent of stainless steel and plastic utensils. They are aware of the fact that the pots they make can earn a few hundred rupees only. These pots are being sold for thousands in the market. They have no option but to continue with their metal craft hoping that none of the future generations have to suffer. Meet the workers of Tambat Ali and get to know their everyday struggles. 1. “When I was younger, my foot and thighs would hurt a lot while hammering the design on the piece and using the foot for support. Now I have become used to it. 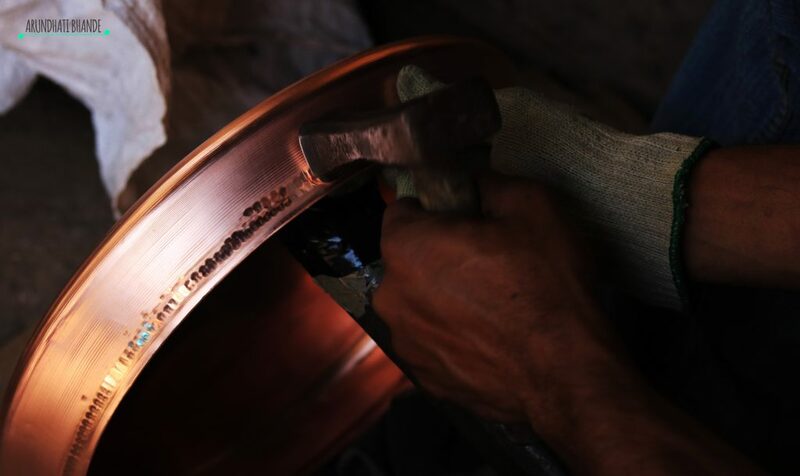 I can keep my foot still for half an hour while I am finishing a piece, this ensures that the consistency is maintained.” Ganesh Karde was 18 when he started working with copper, it has been 25 years since. 2. “I have a degree in Bachelors of Commerce, the constant sound of hammering has affected my hearing, but this is the only job I can do the best. I wear gloves while working because I have clammy hands and the moisture may leave black marks on the copper.” Ajit Pimpale is from the third and the last generation of copper workers from his family. This photo story has been created by Arundhati Bhande. She is among the 20 students a.k.a heritage enthusiasts from The Symbiosis Centre for Media and Communication who participated in the Make Heritage Fun! event held on 26th March 2017, in Pune, India. In Mithila, an ancient city of Northern Bihar which is now known as Madhubani, nearly all women are experts in one or the other popular crafts of the region, namely – painting which has now become famous as Madhubani / Mithila painting, embroidery, papermache craft and Sikki grass work. Products made in these five crafts by a girl raise her popularity in the family. Such is the importance of sikki craft in the region. Sikki craft is one of the most practiced craft form in the region and an outstanding art and handicraft of Bihar. It is one of the traditional art forms of Bihar and is a beautiful grass product of India. The Sikki grass craft has been in existence since hundreds of years. It is difficult to ascertain the exact age of this craft. However, as a craft used for commercial use is a more recent phenomenon, over the last couple of decades. Crafting products, mainly various forms of utilities, divine figures, and toys, using Sikki grass are an integral part of the living of the women of the part of Northern Bihar. The history of Sikki grass craft shows that the grass craft has been in existence since hundreds of years. It is difficult to ascertain the exact age of this craft. However, as a craft used for commercial use is a more recent phenomenon, over the last couple of decades. Crafting products, mainly various forms of utilities, divine figures, and toys, using Sikki grass are an integral part of the living of the women of the part of Northern Bihar. Generally, munj is used for coiling purpose due to its abundance in Mithila region of Bihar. It is completely coiled over and covered with sikki in such manner that it’s not visible. Takua, the main tool is a six-inch long needle-shaped iron object with a rounded head which is used to grip the needle. Usually, the takua is used by the right hand and the product is held accordingly by the left hand. To make sikki grass more pliable it is dabbed with water. No threads or cords are used. Even though sikki is a golden colored grass, various colors are added to it to make colorful attractive products from it. Purple, deep blue, bright yellow, magenta, green and red all combined with the natural golden color of sikki grass are popularly used. The coloring is achieved by boiling sikki in different colors until the desired shade is reached. Mauni- Trays for fresh fruits, betel leaf and nuts, flowers, etc. Pauti- Beautiful small boxes with caps to keep jewellery, Dry fruits, and other costly items. The present status of sikki grass craft has changed. Due to the invasion of television and other forms of entertainments women have found new ways of spending their time. This has decreased the popularity of this craft form. Industries in the area have decreased the availability of Sikki grass. But still, some women practice this craft form, mainly in Madhubani, Darbhanga and Sitamarhi regions of Bihar. These days new products like mobile cases, toys, paperweights, pen stand and other products are made besides the traditional products. Coiling without using munj is done by some artisans. Also, there is an evolution of the sikki grass art.A new art form has emerged using Sikki grass inspired from the Madhubani paintings wherein sikki grass is stuck on patterns of Madhubani paintings..
Karnataka tableau at the Republic Day parade in New Delhi featured Bidriware and Bidri artisans from Bidar. A handicraft which recognizes itself as the symbol of Wealth. The term Bidriware originates from the township of Bidar. It’s a chief center for the manufacture of the unique metalware. Due to a striking inlay artwork, Bidriware metal art is also a primal export handicraft. The metal utilized is blackened alloy of Zinc and Copper inlaid. Along with thin sheets of pure silver (99%), so It never tarnishes during oxidization. Bidri work thus is an outstanding Karnataka art and craft form. Artisans anticipate that soil of Bidar is away from sunlight & rain for years and Therefore, it has great oxidizing properties. The metal extract in the soil makes it more unique. The artisans also say that “the real art lies in testing the mud which is necessary for making its article. Artisans taste it by their tongue and then decide whether to use it or not.” This knack comes from experience is passes on to next generation. The art form origins in ancient Persia. It came to India by the followers of Khwaja Moinuddin Chisti. The art developed in the kingdom is intermingled with Turkey, Persia and Arabic countries and mixes with the local styles. Thus a unique style of its own was born as Bidriware. In particular, one of the oldest records of origins of this art form is that of Abdullah bin Kaiser, a craftsman from Iran. He was invited by the Sultan Ahmed Shah Bahmani for decorating royal palaces and courts. Kaiser joined hands with local craftsmen and give birth to Bidriware under the rule of second Sultan Alauddin Bahmani. The art expands markedly and handed over to succeeding generation with time. Fortunately, today also we can enjoy its exclusivity. The craft has been handed down to succeeding generations. Mostly among the local Muslim and Lingayat sects, this metal handicraft is also seen in Hyderabad. The general artifacts made are vases, huqa bases, jewelry, bowls. These artifacts are incredible sovereign of the Indian Heritage. 1. 700 artisans, including a few women in Bidar city, still continue to create Bidriware artifact. 3. Rehaman Patel – An artist based in Gulbarga has done an extensive research in Bidri Art collecting all evidence historical background of bidri. 4. Victoria and Albert Museum in London also have some collection on Bidriware. 4.District Archaeology and Museum, Nizamabad. 5. Prince of Wales Museum, Bombay. “In art, man reveals himself and not his objects”, Rabindranath Tagore on art and artisans. Art is the language of culture and the artist is the poet. The true intricacies and beauty of art can be seen in the hands of the artisans, who put their soul into making a single piece of work. All art forms around the world have their own story to tell. But unfortunately for some of them, the audience is unable to lend a listening ear. As a result, many of our traditional art forms are now on the verge of fading away. We, at Nazariya, are working to promote these dying art forms and to restore the artisans their pride and dignity, which they once enjoyed. Lifestyles have changed so rapidly that our traditional crafts and art forms have been consigned to the archives, dying slowly with each new generation being brought up unaware of our cultural heritage. Lack of funding to globalization, a lot can be attributed to the decline of art. As a result of this, the millennials are mostly unaware of the art forms that make up our rich cultural heritage. Even people who wish to know more about them, find it difficult to do so. All that they are left with are trips to museums and libraries, which provide only half the picture. The Kinnera; a string instrument played by the Chenchu tribe and which is on the verge of dying. To read more about this click here. One of the reasons why traditional art forms are dying is because the children of these artisans no longer want to carry on their ancestral art. The technicalities behind these arts are passed on to the younger generation and the knowledge is mostly confined to the same family or clan. Since machine-made art is cheaper and cost-effective, the age-old traditions have faced a backlash. Even though traditional art forms require huge commitment and dedication, these artisans seldom get enough recognition and financial support. This leads the youth to abandon traditional arts making it a major factor in their decline. Nazariya helps them by giving them a bigger platform and an engaging audience to work with. As soon as the market for traditional art forms improves, then money would automatically flow. So, there is a need to bridge the gap between the urban and the rural. While traditional art forms flourish in villages, they do not have an urban outreach. Consequently, Nazariya provides these artists with a platform to showcase their work and helps in building connections with the urban market. By being a part of Sargaalaya International Arts and Craft Festival- 2016, we have, thus, taken our mission to a new level. We are not simply a storefront for selling paintings and art & crafts, our aim is to build deeper interactions between the customer and the artisans. In addition, we also organize regular workshops, where visitors can have face-to-face interaction with the craftsman. After all, Mahatma Gandhi once said, “true art must be evidence of happiness, contentment, and purity of its authors.” And to revive the art, we need to provide opportunities for the artist. Given below is a list of some artisans and the art they specialize in. In order to read more about various artisans and their work, click here. Sargaalaya, the Kerala Arts and Crafts village in Kerala, is an initiative of the Department of Tourism, Government of Kerala. It is an exclusive place where you can not only pick a product fashioned by the traditional artisans of Kerala but also learn one or two lessons in the subtleties of crafts-making. While designed as a tourist destination, Sargaalaya is also a platform for exhibition, sales, and craft-making. The tourist can have face-to-face interaction with the artisans showcasing their life-long achievements, and maybe learn a thing or two! We, at Nazariya, focus on building a platform where you can not only purchase unique handmade products, but also discover the behind-the-scenes of who makes them, what their story is, and experience their journey in a way you could have never imagined before. Our aim is to provide a platform to the artisans and help them showcase their talents and handiwork to the masses. We also organize workshops to allow the people to gain better insight into how the artist’s mind works, what nuances go into making a single piece of craft, and help them learn a few basics themselves. The core values of Sargaalaya and Nazariya are the same; revisiting art forms. The only difference is that we focus more on how to revive dying forms of art around the world. The thought is the same but the thinkers are different. Given below are some art forms that Nazariya would be focusing on presenting at Sargaalaya International Arts and Craft Festival- 2016. Wood carving is a form of woodworking done by a cutting tool (knife) in one hand or a chisel in two hands or with one hand on a chisel and one hand on a mallet, to make a wooden figure or figurines of deities, like Buddha and Ganesha. It originated in Rajasthan in the 17th century. Intricately carved wooden doors and windows in palaces and havelis are testimonies to its popularity in the medieval era. In fact, even today this craft is practised extensively in various parts of Rajasthan. Phad painting is a style religious scroll painting and folk painting practised in Rajasthan, state of India. Phad painting is traditionally done on a large piece of cloth or Canvas known as Phad. The paintings are the life of two legendary Rajasthani heroes, Pabuji and Devnarayan ji, who are worshipped as the incarnation of lord Vishnu and Laxman. 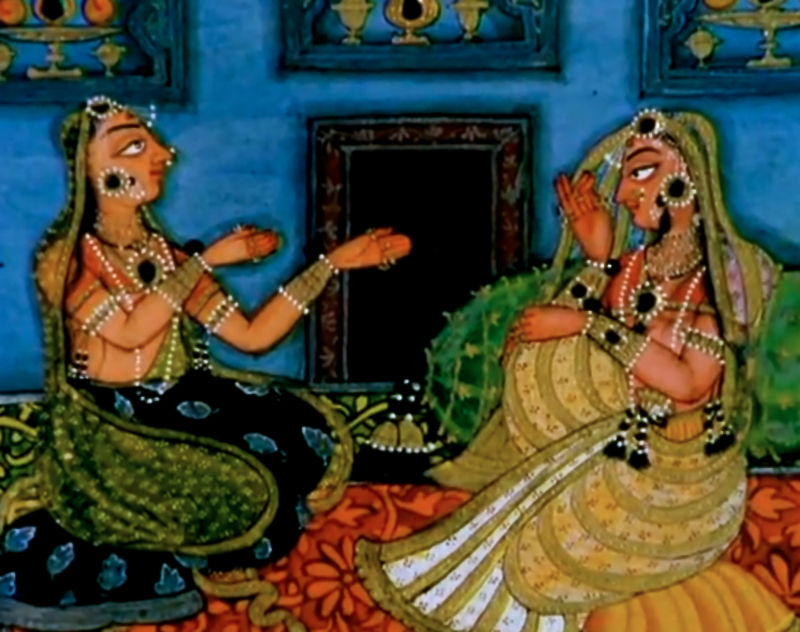 While the story is narrated using songs and dance, the visual impact is provided by the phad. Miniature paintings are beautiful handmade paintings which are often vibrantly colored, but as the name suggests, very small in size. Also, very intricate and detailed work goes into making them, which further gives them a unique identity. The art of miniature painting was introduced in India by the Mughals, who brought this art form from Persia. Here, the themes mainly depicted are court scenes, gardens, forests, palaces, stories of Lord Krishna, love scenes, and battles. Puppetry has always held an important place in traditional entertainment. Like traditional theatre, themes for puppet theatre are mostly based on epics and legends. Puppets from different parts of the country have their own identity, and regional styles of painting and sculpture are reflected in them. 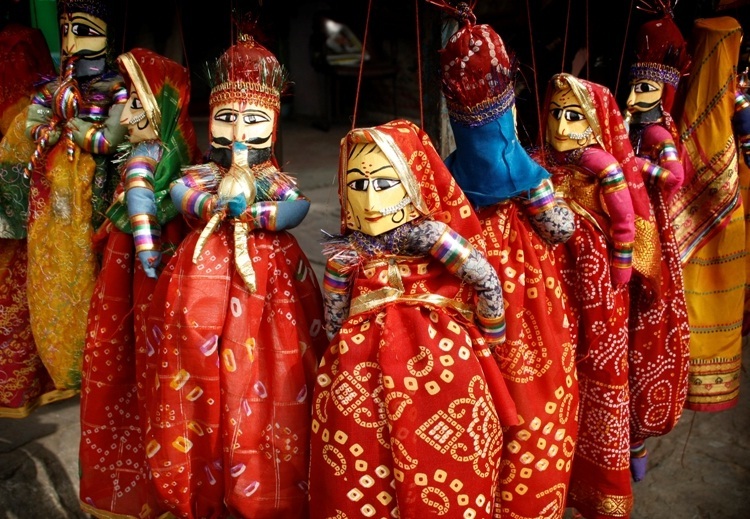 Like the string puppets from Rajasthan are known as Kathputli, similarly string puppets of Orissa are known as Kundhei, and puppets from Tamil Nadu known as Bommalattam. Gond Art is a reflection of India’s largest Adivasi community called Gonds in Bhopal. It is the art of stories, the art of spirituality and is believed to bring good luck. The Gonds were storytellers who used to narrate the stories glorifying the king and this was the main source of their livelihood. The Gonds painted their walls with lively portrayals of local flora and fauna and gods and the art form is created by putting together dots and lines. Here the artists use colours developed by charcoal, plants sap, cow dung and leaves. The passion and heart that the artisans put into creating these art forms are what distinguish them truly. Every art form has a deep history, a deeper soul, and this year at Sargaalaya International Art and Craft Festival, Nazariya is going to help voice their stories. Characterized by fluid curves and flat bright colours, Kalighat painting occupies an important place in the history of Indian art. It was the urban and reformed version of the Midnapore school of Patachitra, a scroll painting tradition of Bengal. Liberating itself from the confines of religious narratives, it went on to comment on the contemporary socio-political phenomena. The rustic folk simplicity was replaced by the emerging complexities of city life. In the early 19th Century, rural patuas (the community of Patachitra painters traditionally carried the surnames ‘Patua’ and ‘Chitrakar’) from Midnapore migrated and settled around the Kalighat temple, on the banks of Adi Ganga. Kalighat being a major pilgrimage center attracted thousands of devotees round the year. The devotees wanted to carry something as souvenirs on their way back from this sacred place, and the locally available, cheap paper painting was the only affordable option. In the memoirs and travelogues of the European travelers, these paintings have been called ‘Bazaar paintings,’ a description that carries a sense of inferiority when compared with the Occidental standards of art. This is primarily because the painters lacked the sense of perspective, and the linear rhythm of human figures miserably failed to impress the lovers of realism. Kalighat painters faced draconian competition from the ever-expanding market of lithographs and cheap oleographs and gradually disappeared by the 1930s. The medium of scroll painting has a vibrant history in this part of the continent. In an age when the society and economy were primarily agrarian, bards toured from village to village with their painted scrolls, unfolding the world of Puranic epics and folk myths to the curious audience. These demonstrations were accompanied by narrative songs. The Cherial paintings of Andhra Pradesh, Phadpaintings of Rajasthan, and Patachitras of Bengal and Orissa are part of this vivid and arresting storytelling tradition. Patuas of Midnapore used scrolls known as ‘jorano pat,’ which were executed on cloth and could be rolled easily. There were divisions within the patua community on the basis of the duration of tours. The ‘Duari patuas’ travelled from door to door throughout the day in nearby villages and returned home by night. The ‘Doori patuas’ travelled long distances, exhibiting their works and narrating stories. The themes were from folk literature. Episodes from the ‘Mangal kavyas,’ creation myths, magic and cult-rituals, agrarian lives, pantheistic practices such as ‘pahar puja,’ and Hindu epics were painted and sung. Changing times- Stylised Midnapore paintings, quite different from the traditional style. Initially, the Kalighat school produced images of Hindu Gods and Goddesses, keeping in mind the target audience. The rolling scrolls were replaced by rectangular sheets. Cheap mill made paper was used for painting, but the painters retained the tradition of using natural colours. The outlines were painted in black using lampblack, which was later filled in with bright flat colours. Turmeric was used for yellow, red chilies for red, indigo for blue and so on… The paintings acquired a semi-classical finesse due to the application of colloidal tin for the purpose of depicting jewellery. Secular themes entered the painters’ world soon and Kalighat school emerged as a satirical genre, highlighting the inherent hypocrisy of the society. Their detailed observation of an evolving social class helped them to produce symbolisms in art, which could be interpreted as important sources of modern Indian history. The flamboyant Bengali nouveau riche or the urban elite has been the favorite theme of the Kalighat painters for their ostentatious display and extravagant lifestyle. These paintings unveil the pretentious mannerisms of the nouveau riche by the use of subtle metaphors and visual allegories, which have become an integral part of the Kalighat iconography over time. Kalighat painting is perhaps one of the best primary sources to reconstruct the social history of the19th Century ‘Babu culture’ which flourished in Calcutta. ‘Babu indulging in sensuous pleasures with courtesans’, ‘Babu sitting on a chair and piping the hookah,’ ‘cat with the marks of a saint eating fish,’ ‘horse-race,’ ‘Elokeshi-Mohanto crime case’ were some popular themes. The painting of a young attractive lady sitting in voluptuous posture with her right hand raised above her head, holding a rose in each hand, titled ‘Golapsundari’ is an evidence of the eternal fact that the essence of Indian aesthetics flows down the ages evermore. Similar ‘nayikas’ have been painted earlier by miniature painters of North India. The patuas also painted nationalist heroes like Rani Lakshmi Bai, and scenes from everyday life. These pictures have now entirely vanished. The artist craftsmen are nearly all dead, and their children have taken up other business. In the place of these hand-drawn and hand-painted pictures selling at two or four pice each, garish and evil-smelling lithographs and oleographs – quite appalling in their hideousness – have come. The old art is gone forever – the pictures are now finding their last asylum in museums and art collections as things of beauty which we cannot let die. One of the last practitioners of this art to have received international recognition and critical acclaim is Kalam Patua. He reinvented the Kalighat style by painting contemporary themes and yet retaining the stylized pattern of the traditional works. His paintings are housed in galleries and museums such as the National Gallery of Modern Art, New Delhi, The Victoria and Albert Museum, London, The Museum of Sacred Art, Belgium, etc.. The alleys and by-lanes of Kalighat buzz with life from the dawn-break. But practically none of the residents and shop-owners are aware of the rich painting tradition which once flourished here. I accidentally met the only custodian of this great tradition, residing in the vicinity of the temple, Bhaskar Chitrakar, who is arduously trying to revive the art form. His unflagging efforts do not seek beneficial opportunities, but the admiration and appreciation of a true ‘rasik’.